A young Black child in a white hoodie offers a policeman some of his Sweetiescandy. The officer, who is wearing a Ku Klux Klan hood along with his uniform, points his police issue semi-automatic Glock pistol at the child’s head. They both stand in front of an American flag, the center of which has been torn away to reveal the confederate battle flag underneath. The scenario described above isn’t from a fever nightmare. 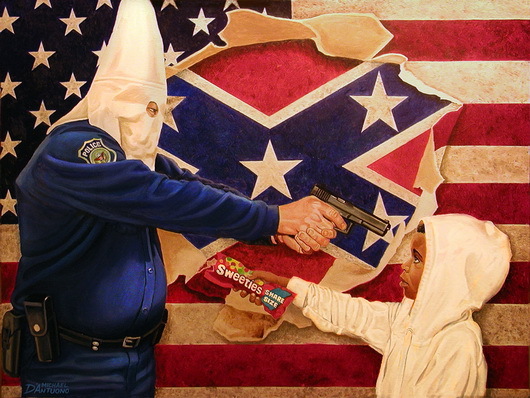 It’s the scene depicted in artist Michael D’Antuono’s painting “A Tale of Two Hoodies.” As the title suggests, it’s inspired by the Trayvon Martin murder. It’s an inflammatory image, to be sure. Some might call it extreme or even irresponsible. Alas, Extreme emotions often require extreme measures to be properly articulated. Of course, those who continually accuse the “liberally biased” media of exploiting the racial angle in this tragedy will point out any perceived inaccuracy to discredit such a message. Trayvon was much older and physically larger than the child depicted here. George Zimmerman was a neighborhood watch captain, not a cop. Last but certainly not least, Zimmerman was of Hispanic descent, making it impossible for him to ever be a Ku Klux Klansman. All of the aforementioned are largely irrelevant to the bigger picture in this case. The child in the painting is representative of all innocent Black children who may one day find themselves in a vigilante’s crosshairs thanks to the “Stand Your Ground” law. He’s not necessarily a stand in for Trayvon. Also, Trayvon was essentially still a boy. He had not yet fully crossed over the threshold to manhood at the time of his death. Zimmerman was indeed a neighborhood watch captain and not a police officer. The racist cop represents the system that failed to bring Trayvon’s killer to justice in a prompt and timely manner, largely because it harbors many of the same prejudices exhibited by said killer. Both the law enforcement community and the judicial system see Trayvon and his kind as a threat. Yes, Zimmerman is Hispanic, but that doesn’t preclude him from harboring racist views against Blacks. There are plenty of self-hating Blacks and Hispanics in America that identify with racist whites. One doesn’t have to be a card carrying Klansman to think as they do. There is a Norman Rockwell quality to D’Antuono’s work, particularly in its photoreal appearance and attention to detail. 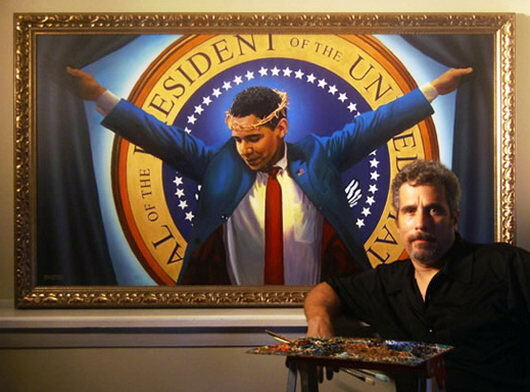 While Rockwell celebrated all that was heartwarming about America, D’Antuono pulls back the curtain to show the nightmare lurking behind the façade of a daydream. The Dixie Flag bursts through “Old Glory” like Clark Kent ripping open his shirt to reveal the Superman shield. America’s legacy of fear and hatred shines through no matter what. Sometimes provocateurs are needed to give the populace a swift kick in the pants. Michael D’Antuono manages to see America through the eyes of its victims. “A Tale of Two Hoodies” offers a clear and vivid picture of what he sees, and it isn’t pretty.